Guildford Saints Football Club policy is fully committed to safeguarding the welfare of its members. The Club adopts the F.A. Child Protection Policy and abides by the Football Association Regulations. 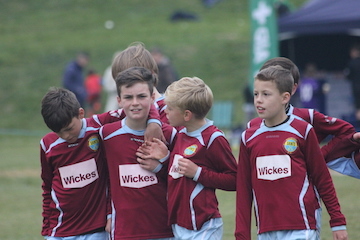 Guildford Saints F C believes that every child or young person, who plays or participates in football, should do so in a safe environment and be protected from abuse. The Club recognises its responsibility to protect all children and young people from physical, sexual or emotional harm and from neglect or bullying. This policy applies to anyone in football whether in a paid or voluntary capacity. All coaches, volunteers, parents and players should show respect and understanding for all and conduct themselves in a manner that reflects the principles of the Club. Guildford Saints will consider, having taken advice and appropriate CRB checks, whether anyone who has a previous criminal conviction or caution for offences related to the abuse of children or young people, violence or any sexual offences should be excluded from working with children and young people. This position is re-enforced by U.K. legislation and guidance. Guildford Saints Football Club will ensure that everyone involved with the children and young people is safe to do so and knows exactly what is expected of them, in relation to Child protection. Ensuring that the managers and volunteers who organise the matches and train the members have valid CRB check. Those above have a personal referee not related to the applicant but who knows of the applicant’s character, trustworthiness, and previous experience of working with/looking after children. Those above undertake a confidential interview with the Responsible Officer. Have awareness of their responsibility towards Child Protection and the role of the Responsible Officer. Managers are alert to this policy and have basic awareness of Child Protection practice in order to promote the children’s safety and well-being. They have attended training courses in Child Protection and First Aid. Ensure this policy is implemented throughout the Club’s activities. This includes the personnel, their practice and the premises in which the activities take place. This includes undertaking a site audit. Ensure all necessary Child Protection related enquiries and investigations are carried out. If necessary report concerns to the Children’s Services. Make recommendation to the Club Secretary and the committee for approval of volunteers, coaches, managers and volunteers. Undertake and report the results of CRB/screening enquiries to the Club Secretary and to the Committee. Ensuring current procedures are implemented in the enquiry process. Maintain Confidentiality on a need to know basis. Disclosure or evidence for concern may occur in any number of ways. This may be by what a child has said, about him/herself or another child or children. It may be through interception of a written item, or through observation of activity or behaviour giving cause for concern. It may be through changes in behaviour or attitude. There may be physical, emotional pointers such as bruising, staining, inappropriate behaviour or knowledge. Volunteers can pick up several other signs. All those working on Guildford Saints activities have a duty to ensure that any suspicion, incident, allegation or other manifestation relating to Child Protection is immediately recorded and reported to the Club Secretary or the Responsible Officer. Make a judgement as to the nature and the risk of immediate danger to the child. Where the risk of danger/ injury or worse seems imminent to the child, then the CPO is authorised to make a complaint to the Police in order to secure immediate action and protection of the child. NO PROTOCOL SHOULD EVER INHIBIT THIS COURSE OF ACTION IF IT IS TRULY WARRANTED. If the risk is not imminent but there are significant concerns speak with the Duty Officer at Children’s Services immediately: this covers any situation where it is perceived there is danger to a child or detection of criminal offences against a child or other form of ongoing/future/recent serious harm. Prior to speaking with the duty officer, the CPO will consult with the volunteer / trainer/manager involved. In the event of concerns of relating to abuse consult with the Duty officer at Children’s Services or the duty Police officer. The person receiving the complaint will contact the Club Secretary. The Club Secretary will contact the CPO. On receipt of the complaint, the CPO will contact Children’s Services to appraise them of the situation. This will be by informal channels but if there is a criminal allegation, the contact will be formal to the duty social worker and also to the police. The Club Secretary should inform the person against whom the allegation has been made as soon as possible. UNLESS THERE APPEARS TO BE A CASE THAT THIS MIGHT PREJUDICE A CRIMINAL INVESTIGATION. This will require consultation with the police to ascertain. The course of action to be taken from thereon will be decided by the nature of the allegation(s). All children will be appropriately dressed. Photography or recording should focus on the activity, not on a particular young person. Images should focus on small groups rather than individuals. Images of a child who is under a court order should never be photographed. If a young person is named their photograph should not appear in any editorials. If a photograph is used avoid naming the person or use first name only, personal details should never be revealed. Parents of carers of all young players must give permission for any images to be taken. A permission form must be signed by a parent/guardian before any photography takes place. Concerns regarding inappropriate or intrusive photography should be reported to the Responsible Officer. A report should be submitted and the local Police advised. A report should also be submitted to the F.A.